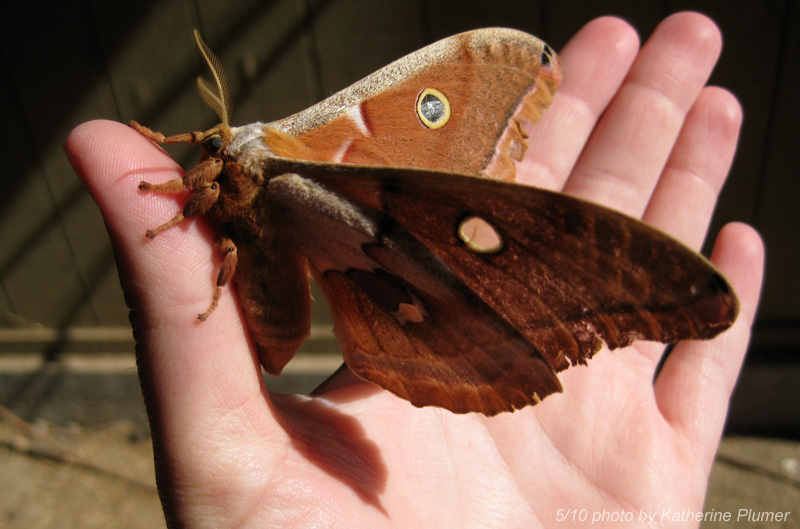 First off, the moth has been identified as a Antheraea Polyphemus, or Polyphemus Moth. So, I was wrong yesterday, but pretty close. To my extraordinary surprise, the moth not only didn't die last night but was very much alive this morning. So I let him go. He walked up my hand, flew onto my forehead (right, did I mention I'm not a bug person, don't think my heart didn't go flippy flop right then), and then was up and away into the blue yonder. I may never see another. Oh yeah, and those wing spots are clear! How cool is that?! What a big insect! -BMc. Wow, I was suprised to hear it was still alive as well! What a neat experience, and what a cool animal. I would love to see a moth like that in person!